Despite having no commercial funding this year, we all decided to push through with it anyway. 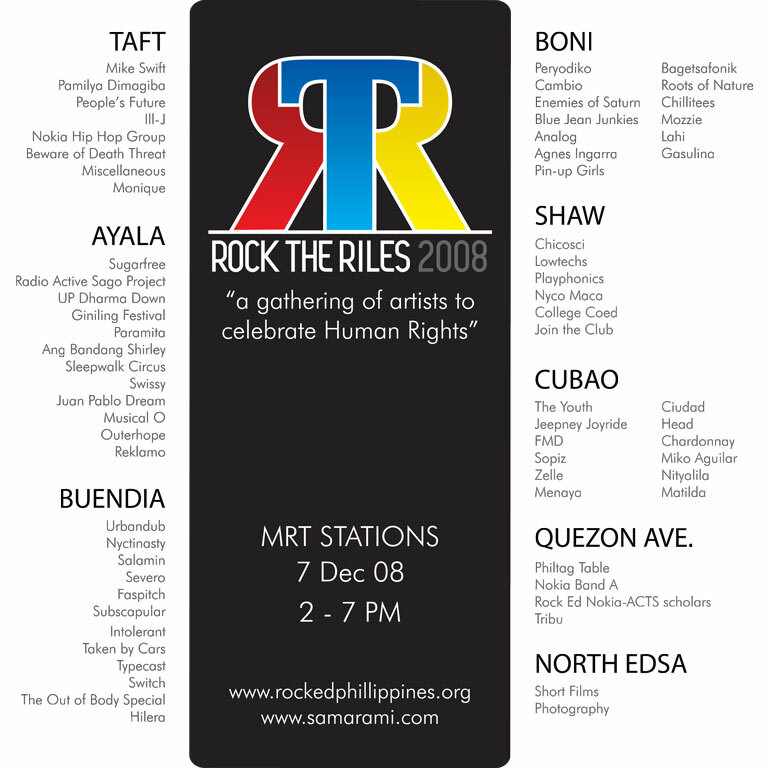 Everyone involved in 'Rock the Riles 2008' pitched in to make it possible. Shelled out cash, lent some equipment, lent expertise, talent and time. This is funded by the generosity of many many people. So we can squarely say: This one's ours. This gathering is our rally of sorts, that one time we decide to physically come together and say the same thing at the same time. That one time we decide to pool our voices and say "No more excuses, Philippines." Next Sunday, take the train. Save the date: 7th of Dec, 2008. 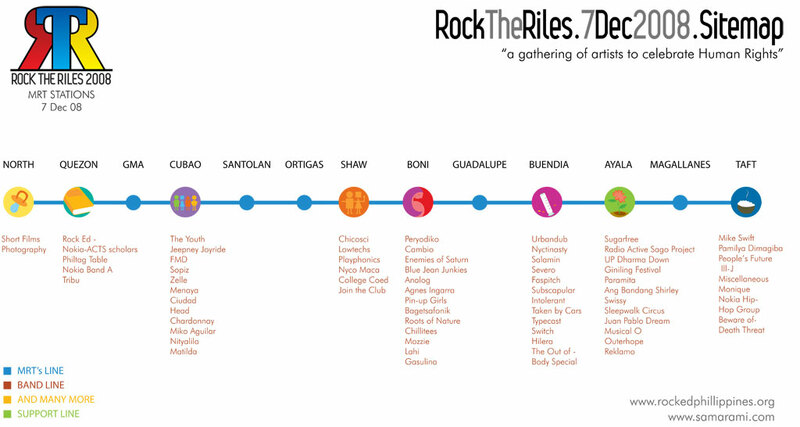 2-7pm at any MRT station nearest you. 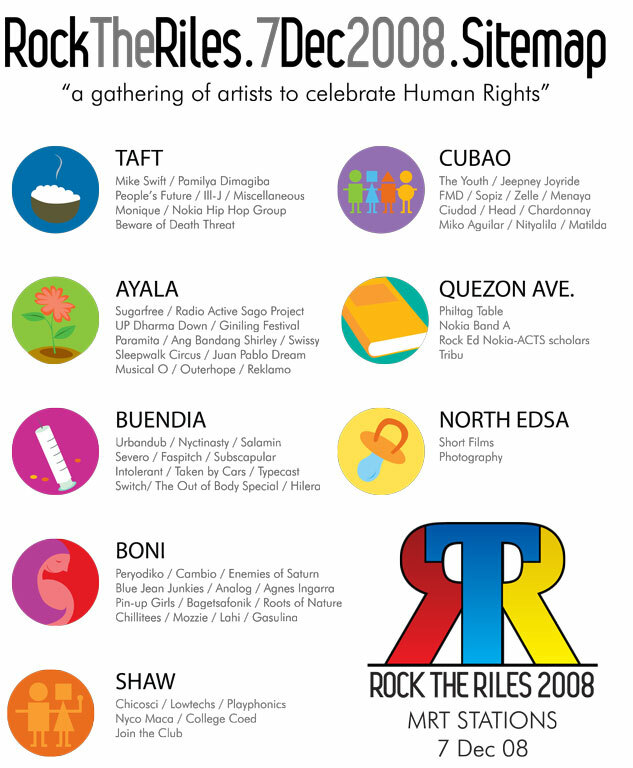 Confirmed artists: Radioactive Sago Project, Sugarfree, Up Dharma Down, Gasulina, Pedicab, Sandwich, Giniling Festival, Paramita, Ang Bandang Shirley, Sleepwalk Circus, Swissy, Juan Pablo Dream, Musical O, Outerhope, Urbandub, Intolerant, Taken by Cars, Typecast, Switch, Out of Body Special, Hilera, Nyctinasty, Salamin, Severo, Faspitch, Subscapular, Peryodiko, Cambio, Enemies of Saturn, Blue Jean Junkies, Analog, Agnes Ingarra, Analog, Pin-up Girls, Bagetsafonik, Roots of Nature, Chillitees, Mozzie, Lahi, Chicosci, Lowtechs, Playphonics, Nyco Maca, College Coed, Join the Club, The Youth, Jeepney Joyride, Sopiz, Zelle, Menaya, Ciudad, Head, Chardonnay, Miko Aguilar, Nityalila, Matilda, PhilTag, Nokia-Rock Ed ACTS Music Scholars from Childhope Asia and Virlanie Foundation, Tribu rap artists, Beware of Death Threat, Miscellaneous, Monique, Ill-J, Mike Swift, Pamilya Dimagiba, People's Future and more.